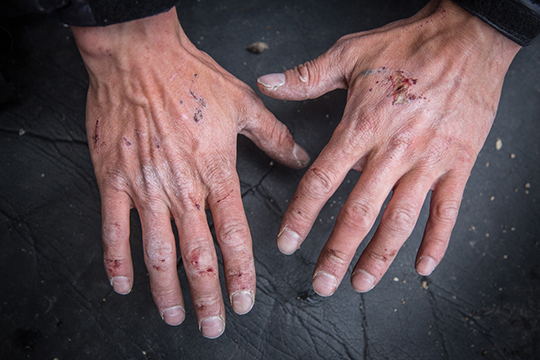 On July 27, after 15 days of tricky free climbing, hard aid and intermittent snowstorms, Leo Houlding wrote a simple message to his support crew back home, "We nailed it!" 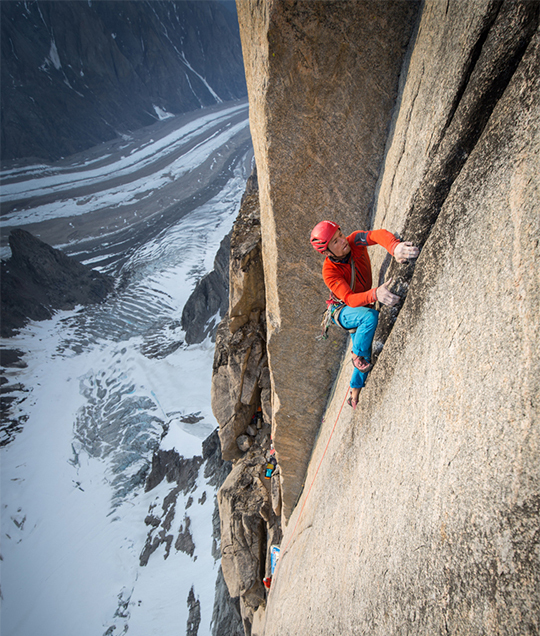 It was the first ascent of the northwest face of the Mirror Wall via Reflections (E6 6b/5.12c A3+), a 1200-meter granite cliff that towers above the Edward Bailey Glacier in eastern Greenland. The 35-year-old Houlding, one of Britain's most accomplished climbers, boasts a resume of routes including The Prophet (E9 7a/5.13d, 1,970', Houlding-Jason Pickles) in 2010, a new free climb on El Capitan that took nine years of work to complete. His expeditions include Patagonia (2001—cover of Alpinist 0), Mt. Everest (2007), Baffin Island (2009), Venezuela (2012) and Queen Maud Land in Antarctica (2013). Houlding and his teammates Matt Pickles (cousin of his longtime partner Jason Pickles), Matt Pycroft, Waldo Etherington and South African climber Joe Mohle arrived in Greenland on June 25. Their objective was the unclimbed northwest face of the Mirror Wall, a face taller than Yosemite's El Capitan, which they aimed to free climb. 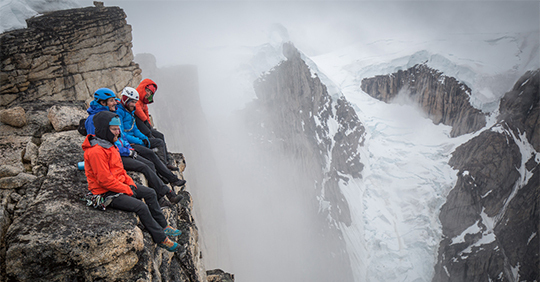 They climbed the wall under 24-hour light and an ever-present cold mist. Their last seven days on the wall had worsening weather and falling snow. After ferrying heavy loads over loose, knee-deep snow and through dangerous crevasse fields, the team spent three days fixing ropes up the lower wall to Bedouin Camp, 260 meters up the wall. 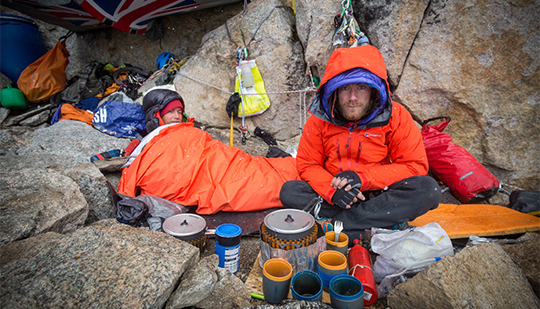 They then spent 12 nights on the wall, usually at portaledge camps, while establishing 25 pitches. Twenty-three out of 25 pitches went free. Houlding described the climbing as "Hard free, hard aid, wide...loose...grand traverses and complete blankness...." They topped out in a light snow storm at 4:20 a.m on July 22. The team rappelled back down, cleaning their gear and flew back home by helicopter on July 28. In 2012, a Swiss expedition climbed the first ascent of the unnamed peak (2050m) up the right side of the Mirror Wall (Ledgeway to Heaven, 7b+ A1 45 degrees, 1200m, Jacksch-Ledergerber-Reist-Schupbach) over 10 days. Next they climbed the ridge bounding the left side of the face alpine-style in three days via Midnight Solarium (7b 45 degrees, 1100m). 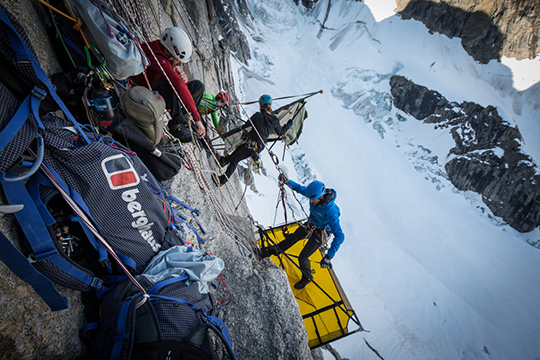 Alpinist interviewed Leo Houlding over email to learn more about the Mirror Wall ascent. Alpinist: Where is your route in relation to the Swiss routes? LH: The Swiss climbed the two most obvious lines. Both climbs, however, skirt the edges of the main wall, a bit like the West Face (5.11c, 1,500') of El Cap. We wanted to climb directly up the center. The only line we saw that would not require drilling went up the left side of the main face and linked into the impressive headwall with a devious aid traverse just above half height. Alpinist: Tell me about the climbing team. I heard that the crew had "little experience in this game." LH: I have done stuff with all the guys over the years and all are very talented and experienced in their fields, however, none of them have ever been on a big-expedition first ascent like this. 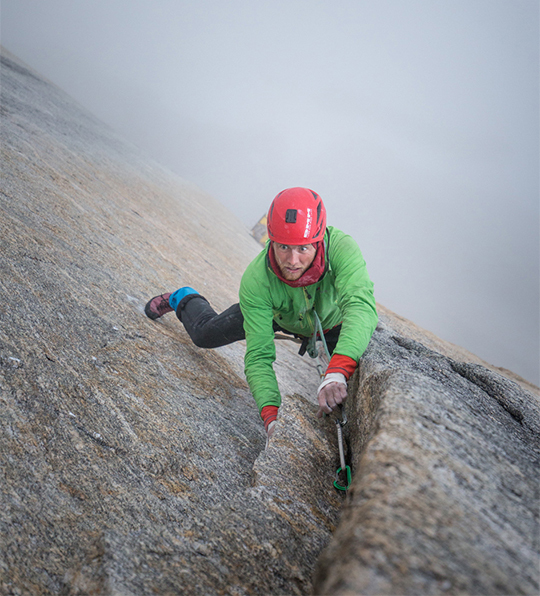 Joe, from South Africa, is a strong trad climber with lots of experience on bigger routes in remote areas. Matt Pickles is an 8c sport climber who used to trad climb and has climbed El Cap. Waldo is an extreme recreational tree climber and rigging master with some rock climbing experience. Matt Pycroft is a talented, adventure filmmaker and photographer. Alpinist: Why do you refer to the Mirror Wall as a grown-up playground? LH: I was referring to the whole area, the moraine hiking, crevasse jumping, campsite building, the trail breaking [and] the climbing. No rules, no regulations, no referees and no help if anything goes wrong. You are free to play to your heart's content and are entirely responsible for your own actions. Alpinist: What was the rock like? LH: [It's] mainly okay with quite a bit of loose stuff in the cracks and on ledges. There were a few stellar clean splitters and the granite up high was lovely. There were also some quartz sections, one corner about 20 meters long was entirely crystals—[I] never climbed anything like it before. Alpinist: What about low points and high points? LH: The glacial approach [to the wall] was pretty dangerous, lots of hidden crevasses. Lots of serac collapses, avalanches and rockfalls, although none directly threatened our route. The steep snow slope to get onto the cliff was unpleasant, loaded with deep, heavy wet snow and we didn't bring enough rope to fix it. It was a record snow year and we were there during the melt so the landscape changed dramatically. The standout moments were finding a way through a blank section above Bedouin Camp (260m) that went free onsight, with no drilling. I enjoyed the A3+ pitch, a six-hour lead through the night [also] with no drilling. Alpinist: Tell us about the climbing—the key sections, the aid and free climbing and the descent. LH: There were no-fall sections on 5.11 terrain but the harder climbing was reasonably safe. The aid was hard, lots of hooks, beaks, microwires and blades but never too dangerous. The key sections [of climbing] were two blank bits, [including] a blank traverse that required 10 rivets to reach an obvious line to the summit. We drilled 11 lead bolts and rivets and 30 belay and camp bolts. [We] rapped the route and [did] two big lowers with the kit. Worked like a charm. on some pitches, two guys rap back down to re-lead a pitch for photos. 90% of all pro climbers are contractors to marketing departments, what do you/we expect? Photos from above looking down at the climber on the FA of a big wall. Hmmm. a photo that shows the line of ascent would be great.